Are you ready for a relaxing time away from home, but in your own comfortable easy-to-use Ascape MT travel trailer? You can do a little entertaining in this model with all the seating throughout. An added bonus with the flip-up seating is the storage below offering space for oversized coolers and outdoor camping gear! You can enjoy your meals at the U-shaped dinette and at night easily convert this area into a bed. The frameless windows allow you to enjoy the view without having to leave the comforts of inside. And there is a Zamp solar port if you choose go camping off-grid, plus this model weighs only 1,170 lbs. unloaded. For any camping trip whether near or far you will want an easy to tow Ascape travel trailer by Aliner. These models are lightweight in design and have 600 lbs. to 1,330 lbs. of carrying capacity depending on the unit, include a Zamp solar port, plus include a single 2,500 lb. Dexter torsion axle. 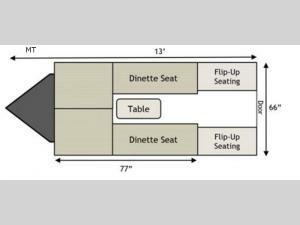 You will also find a U-shaped dinette which easily converts into a bed at night, plus there are more features and options specific to the model you choose!